You know you’re at the right place when you see the big red barn, marked by a grand old oak tree at its entrance, timeless in its stance, overflowing with cascading petunias. An old-fashioned blue farmhouse, surrounded by gardens, sits to one side, and the barn store and other buildings bustle with people. You’ve arrived at Bauman Farms in Gervais, just outside of Woodburn, and what you may have pictured in your mind’s eye of a classic barn and farmstand, you’ve found. 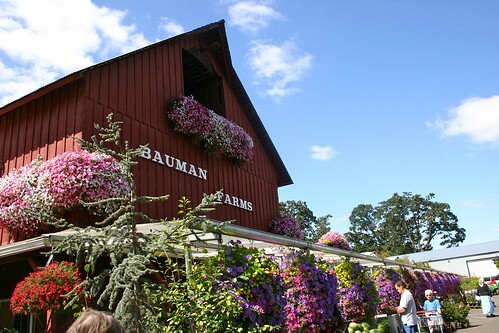 Bauman Farms encompasses 350 acres, owned by several generations of its namesake’s family. “My great grandmother moved here from Minnesota in 1896,” says Brian Bauman, 29, owner/retail manager. “She purchased a piece of land a mile from where the store is located.” Bauman’s grandfather farmed the land and sold vegetables to folks from town. Farming is in the Bauman genes. Brian’s dad built the original roadside stand for his wife, who wanted to sell produce, and Brian grew up in the blue house adjacent to the barn. After graduating from college and working at a Portland accounting firm, Bauman returned to the farm to take over responsibilities. “I knew I always wanted to run the farm,” Bauman says. “I like farming and working with plants, but I was drawn to the business side of things.” And business is definitely a part of the farm, with its plethora of things to see, do and buy. What was once a simple farmstand built for a stay-at-home mom has grown into a destination for those of us charmed by its authenticity, and obvious hard work to stay current and in touch with its customers. It’s also a destination for school kids from near and far, with plenty for them to explore, including interactive puzzles, pygmy goats, chickens, geese and sheep. And did I mention the tee pee? When wandering the farm on a recent visit, my every turn brings a new vista. I know there’s a good eye at work here—a lusciously romantic grape and hops arbor, swirls of color mixed into display garden borders, and a vintage windmill painted with the name Bauman Farms punctuating the landscape. In one of the gardens, huge pumpkins are tucked in for a nap, a blanket atop each one. I soon learn these gourds are capable of putting on 50 lbs a day in September, which is a good thing, since Bauman’s first Giant Pumpkin Weigh Off is right around the corner. From October 2-4, growers and their giant pumpkins will be blazing a trail to Bauman’s to vie for $20,000 in prizes. “We’ll have some of the biggest pumpkins in the country and one of the top prize packages,” Bauman says. Those blankets on the pumpkins? It’s to prevent them from cracking while they grow so quickly. The pumpkins are impressive, but I’m fascinated with Bauman’s cider press. In a building adjacent to the barn, the press operates October through February, producing cider from the 45 varieties of apples grown here. If you haven’t tried fresh-pressed apple cider, you should. Bauman explains, “We use a UV light machine to treat the cider but without changing the sugar content or taste.” And yes, the bakery is a very popular spot during this time, churning out fresh apple cider donuts. 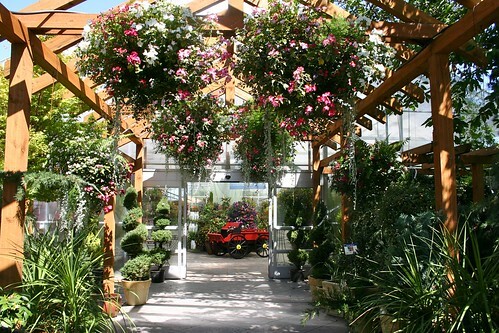 But it’s the greenhouse and plants that continue to inspire Bauman’s work. “My first job on the farm was taking care of the retail greenhouse,” he says. And he’s working hard to keep the farm relevant to his customer’s needs. 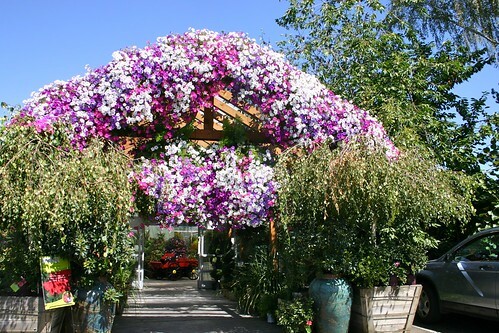 “We do a lot of different container designs, including having people bring in their baskets and planters in January.” Patrons drop them off, Bauman’s plants and cares for them in their greenhouse until May, when the customers can pick them up, already blooming and in prime health. This is truly a family farm, in more ways than one. See more photos and movies from my visit here. 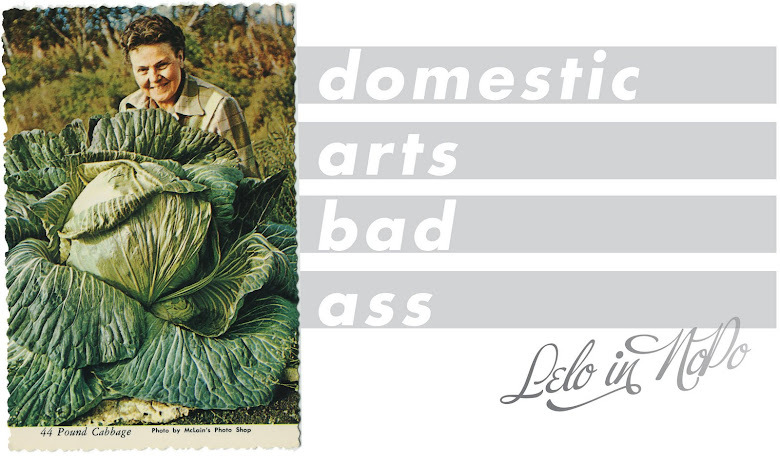 This is a cross-post of my on-going Sassy Gardener column at Just Out. And now I want to run off to start my own farm (clearly, much more fun that studying for grad school entrance exams). Dang it! Sounds heavenly! I always crave cider in the fall and now I know where to go! Thanks! Yay! 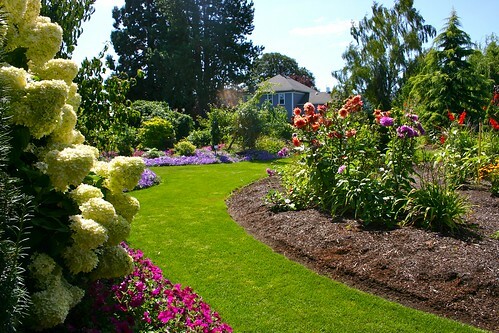 I wish I lived in Portland so not only could I see those amazing flowers for myself (and have them do my container plants!) but I could also try those apple cider donuts - they sound amazing. PS - Lelo's Mom - if you're reading this (because I know you've commented before) - I'm from Hiawatha. lelo, i have not brought the canning pot into the house, but i did spend several hours on saturday peeling slicing and zip locking peaches. I am working through the trauma of canning events of years past. Heather, Hope we meet some day. Hiawatha must look beautiful now with all the maples in fall color. We bought my wedding ring at a jewelry store in Hiawatha in 1958! Lelo, The Bauman Farm is amazing. Do they rent rooms?